Thus does Victor Frankenstein state his future course of study and the goal of his medical career, and thus is born a new type of literature that continues fascinating readers today. While that genre we term “science fiction” is generally attributed to the publication of Mary Shelley’s Frankenstein, or the Modern Prometheus in 1816, if a reader choose to delve farther back in time, he might undoubtedly find earlier examples. Nevertheless, it is with Frankenstein that most modern critics date this particular facet of literature. This anthology focuses on writings of that period, by authors well known for penning such fiction. Editor Michael Sims has chosen a variety of authors, well known in their own time as creators of “fantastic fiction.” Some are still familiar to readers today—Mary Shelley, Edgar Allan Poe, Jules Verne, Thomas Hardy, Robert Louis Stevenson, Ambrose Bierce, H. G. Wells, Rudyard Kipling, and Arthur Conan Doyle—while some are not so easily recognizable—William Henry Rhodes, Florence McLandburgh, Thomas Wentworth Higgins, Edward Page Mitchell, Alive W. Fuller, Wardon Allan Curtis, Grant Allen, Mary E. Wilkins Freeman, and E. Nesbit. 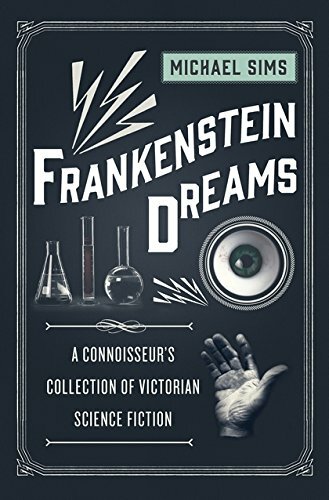 Excerpts taken from Frankenstein, as well as Jules Verne’s Twenty Thousand League under the Seas, and Stevenson’s Dr. Jekyll and Mr. Hyde justify those authors’ exclusion in this volume, while others have their stories reproduced in their entirety. To the modern reader, a good many of these tales will be considered wordy, for some seem merely essays, with little or no dialogue, and a good many of the words themselves are definitely of the more than two-syllable variety. The phrasing may be stilted, or quaint, accustomed as many now are to the frank, sometimes grisly narratives where the author lovingly describes each splintered fragment and flicker of flame and doesn’t hesitate with expletives. Though they undoubtedly amazed the readers of their era, today, in view of discoveries by men actually setting foot on the moon, some now seem rather tame, even naïve, and indeed laughable in their speculations. Editor Sims has amassed a historical and interestingly diverse example of the speculative writing of the Victorian Era. With an Introduction explaining some of the scientific discoveries and theories of the day and linking them to specific stories, the anthology sets the mood for what is to come. There is also a brief biography of each author. A Bibliography and List of Suggested Reading follows the stories for those who wish to further pursue this particular literary niche. In between are tales both fascinating and outlandish, often frightening in aspect, and occasionally thought-provoking in their themes and the questions they ask, but always entertaining. Hideous or not, that progeny had done exactly that. This volume contains a fascinating cross-section of those tales that become the forebears of the many science fiction/fantasy stories of our 20th and 21st centuries.